Project Director Steve Alves gives updates on the editing process. Three new clips are released. 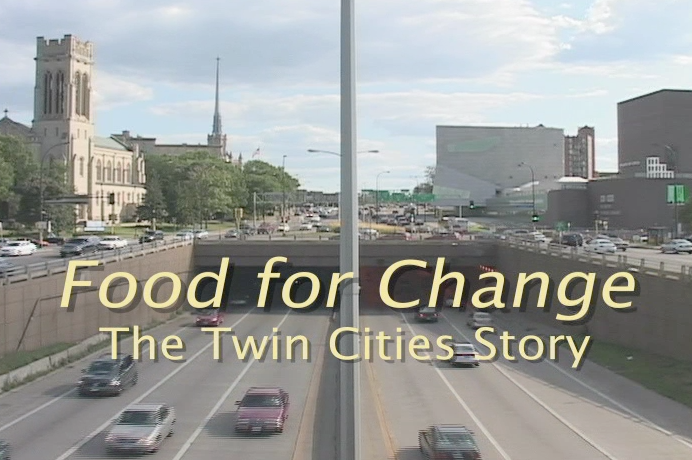 Clip #1 is from the rough cut and examines the growth of food co-ops in the 1970s. Clip #2 features Seward Co-op General Manager Sean Doyle talking about issues facing food co-ops today. Clip #3 is about the new wave of co-op growth. Clips 1 & 2 are not from the rough cut but are a step in the editing process of ferreting out the salient topics for last part of the film. A map of all the principal sponsors is released, showing which co-ops are contributing the film in line with the funding plan. Finally, it is announced that Food For Change will be attending CCMA this year in Philadelphia. Co-Producer Rob Hagelstein gives update on ramp-up of production and editing. Marketing Manager Allie Mentzer reports on Food For Change Director Steve Alves’ keynote speech to the Linden Hills Co-op’s annual member meeting. Erbin Crowell, Executive Director of the Neighboring Food Co-op Association, reports on Steve’s presentation of the film at the NFCA member meeting. Director Steve Alves describes plan for film’s release. Sharon Murphy, General Manager of Whole Foods Co-op in Duluth, Minnesota, tells why her co-op is motivated to sponsor the film. Allie Menzter, Marketing Manager of the Linden Hills Co-op in Minneapolis, Minnesota, says co-ops need education effort to explain difference between co-ops and big box competitors. Chris Maher, General Manager of the Briar Patch Co-op in Grass Valley, California, explains the need for a movie like Food For Change to explain to members and the general public about the cooperative business model. Director Steve Alves explains why film’s historical focus is relevant today. Lindy Bannister, General Manager of the Wedge Co-op in Minneapolis, Minnesota, tells why her co-op is contributing and how the film addresses two of their core principles: education and co-ops helping co-ops. Suzette Snow-Cobb, Co-General Manager of the Franklin Community Co-op in Greenfield, Massachusetts, shares why her co-op initiated the project with a $35,000 investment. Student intern, Jeremy Goldsher, reports that Director Steve Alves was the guest speaker at the Historic Unitarian Meetinghouse’s “Food, Glorious Food!” event and art exhibition in Bernardston, Massachusetts, where Steve presented scenes from his work-in-progress film, Food For Change.